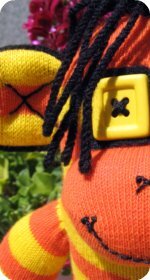 Learn how to make a vintage looking sock monkey toy with the vintage sock monkey patterns and Original Rockford Red Heel socks. 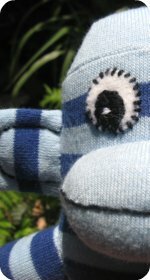 Alter the sock craft pattern to make any stuffed sock animals you'd like. 1. One pair of Rockford Red Heel Socks or any socks you'd like. 2. Stuffing – cut up old nylon stockings, hosiery waste, cotton batting, kapok, shredded foam rubber. Turn both socks inside out. Sew a seam (A) ½ inch on both sides of center of sock, starting 3 inches from white heel and across the end of top. Cut sock between seams and to within 1 ½ inches of white heel. This leaves an opening in crotch. Then turn sock so seams are inside and use crotch opening to stuff head, body and legs. Cap: Cut off the toe of the sock, leaving ½ inch of brown to roll for a brim. Tail: Cut a 1 inch strip the entire length of the front of the sock. Seam and stuff. Mouth: Cut the heel from the sock, leaving a brown edge around the white. Fasten on lower part of face, whipping around the bottom; stuff and finish whipping around the top. The mouth can be improved by running a stitch of either black or white across the middle. Arms: Cut the remaining upper part of the sock into two pieces. Seam and stuff. Ears: Cut the ears from the remaining brown part of the sole of the sock. 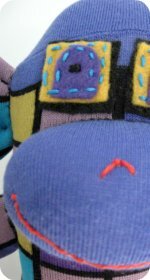 Eyes: The eyes can be made either by sewing on buttons or by embroidering them with black thread. In this same operation a nose can be indicated by two small embroidered marks. There are many variations from this basic pattern. Decorations can be either pompoms, yarn or bells.Sometimes a fez is used for a cap. Jackets and skirts are also used for clothing the monkey. The pdf takes just a small amount of time to download and it gives you one page that contains only the vintage directions and diagrams on it. (Just like the pattern you can see above). The plans are super fun and easy to follow. 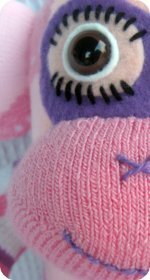 The vintage pattern creates a monkey with a longer tail and narrower arms compared to the modern sock monkey pattern. Also, a cap can be cut from the toe of the second sock when you use the vintage monkey pattern. 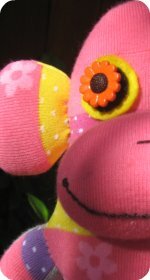 Our funky sock monkeys gallery has photos of different style monkeys to give you ideas and hopefully some inspiration.